I am so excited! It's the first ever Animal Attraction matchmaking event in Wagtail. There are always a lot of cats and dogs around Wagtail, but today is special because we're supposed to mingle. I met a very cute yellow lab named Cooper. We've been hanging out together while my mom, Holly, helps people with boring papers. From what I gather, we dogs and cats are supposed to introduce people to each other. I don't know why this is so complicated for humans. Every dog knows you just walk up to another dog and sniff. Your nose tells you everything. What breed the dog is, how old it is, what it had for lunch, whether it stole your peanut butter treat a few minutes ago, and much more. People are so awkward. There's that odd thing they do with their hands. For a while, I thought they were passing each other cookies. That would be a fast way to make friends! Apparently that's not what they're doing. I understand with us around they have something to talk about, which takes off the pressure to say something clever. I'd like to introduce my mom to Cooper's dad. After all, a cool dog like Cooper must have a terrific dad. But I'm not so sure about the little dog that looks like a Wookie. He's cute enough, but he's wearing shoes. I'm glad my mom didn't embarrass me that way. I think I'll pass on him. PS. 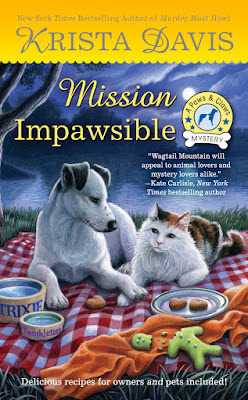 MISSION IMPAWSIBLE comes out on February 7th, but because you were nice enough to read this, Krista says I can give away two copies! Leave a comment with your name and email address so she'll know where to find you if you win. Her nose isn't as good as mine. I'd love to win a copy of this book, sounds like fun. This is one of my favourite series! I can't wait to read it! Thanks for the chance. So cute! I love the matchmaking. Adorable. Looking forward to this book! Thanks for the chance. "But I'm not so sure about the little dog that looks like a Wookie. He's cute enough, but he's wearing shoes. I'm glad my mom didn't embarrass me that way. I think I'll pass on him." I can't wait to read this book. This is a great series. Love books featuring dogs and cats. Thanks for the chance. I love this series and I am looking forward to reading this next book! I would very much like to win this book. I love Krista books they are awesome. I have a couple from this series but not this one yet. Thank you for the chance to get it. I've been waiting months for this to come out! Love these books! This is a new series for me! I would Love to win this one! This Wagtail series sounds just wonderful. I really must get started on reading it. Thanks for the contest. I have enjoyed the past books in this series and look forward to reading this book. dbahn(at)iw(dot)net. I love this series! Fun, exciting, and clever... I am eager to continue the journey. I would love to win a copy. Krista's books are wonderful. Since I think dogs rule, especially my Schipperkes, I think that this book will be a wonderful read. A copy series has to have animals or food or both to be on my list!!!!! I love both your series!!!!!! My poodle, Maltese, and Shitzu give it 5*****!!!!!! This is adorable. I'd love to read this book. Thankyou for the opportunity. Thank-you for the opportunity. i just finished the 1st in the series. I love this series and can't wait to read the newest one! I love the Paws and Claws Mystery series. Puppy nose! I haven't had the heart to get another dog since our Micki passed away last May. Can't wait to read this. awww. how cute! i would love to win a copy of such a 'petacular' book! thanks for hosting the giveaway! I love this series, and I always look forward to each new release! Thank you for the giveaway. This sounds like fun thank you. Thanks for sharing this fun interview! This sounds like a great read and I love the cover!